Personalized Coupon Mailers Custom Printed in Full Color Bulk. 5 1/2" x 8 1/2" with Glued Business Card Magnet. Promotional, Inexpensive. Budget Prices in the USA and Canada. 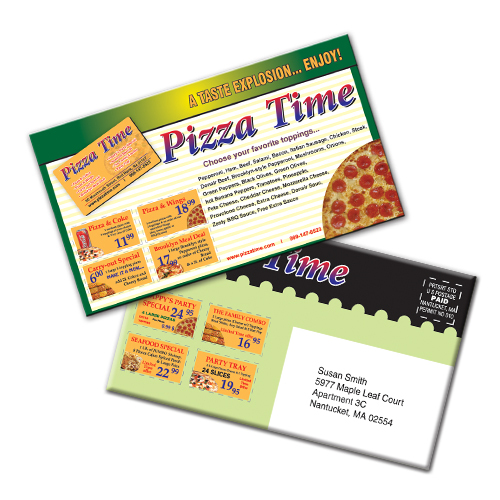 Wholesale advertising Coupon Mailers with Glued Business Card Magnets. Stock 10 pt. paper laminated on both sides. Great for fundraisers. Free set up and Full Color imprint. Free two sided imprint. It Includes 25 mil. business card magnet. Lowest cost in North America. American Clients pay no taxes. The unit prices below include you full color custom imprint on one or both sides. Free Setup Charge. Magnet 3 1/2" x 2"